Longwarry & District History Group Inc.
We found the following newspaper stories as a result of a family member contacting us with some details of their family in Longwarry about 1895. It was not about what you are reading below, however in helping them with their family history we found this fascinating episode in the family and Longwarry history. We might be able to do the same for your family with whatever details or photos you might be able to send us. As we mentioned in a previous issue Mr. Fred. 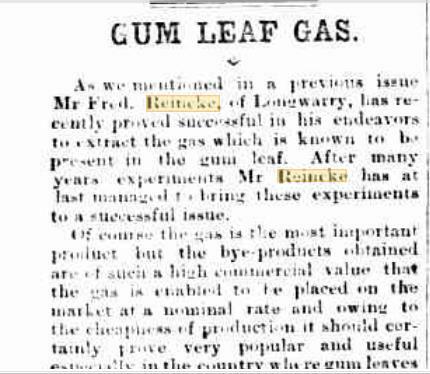 Reincke, of Longwarry, has recently proved successful in his endeavors to extract the gas which is known to be present in the gum leaf. After many years’ experiments Mr. Reincke has at last managed to bring these experiments to a successful issue. Of course the gas is the most important product but the bye-products obtained are of such a high commercial value that the gas is enabled to he placed on the market at a nominal rate and owing to the cheapness of production it should certainly prove very popular and useful especially in the country where gum leaves are so prolific and easy to get. This should be a large point in its favor when it is remembered the immense sum of money annually spent in freight by the different coal gas companies which exist throughout the country and which sum necessarily increases the cost of such gas to the consumers. Desiring to conduct the experiments on a larger scale than hitherto Mr. Reincke formed a syndicate of 4 who have spared no expense in order to complete the investigations which were necessary before exhibiting to the public the result of his labors. Everything having proved satisfactory arrangements were made for lighting Mr. Massey’s store with the new illuminant and considering the primitive methods employed the result has far exceeded their expectations. The gas burns with a nice clear flame and gives a steady white light; it emits no disagreeable smell and is equal to any coal gas now in vogue. Through the agency of a meter specially tested it has been found that the satisfactory result of 12,000ft per ton of leaves has been obtained. Already the syndicate have received some tempting offers for a share in the invention, some of which are still under consideration. It is rumoured that negotiations will be shortly carried on with a view of exhibiting the light at the Bendigo exhibition. 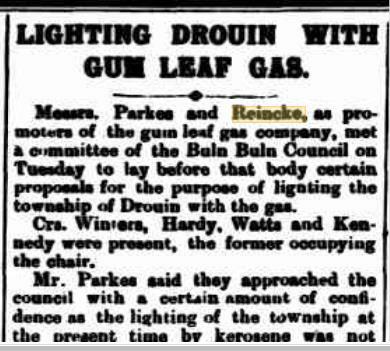 Messrs. Parkes and Reincke, as promoters of the gum leaf gas company, met a committee of the Buln Buln Council on Tuesday to lay before that body certain proposals for the purpose of lighting the township of Drouin with the gas. Crs. Winters, Hardy, Watts and Kennedy were present, the former occupying the chair. Mr. Parkes said they approached the council with a certain amount of confidence as the lighting of the township at the present time by kerosene was not very good. 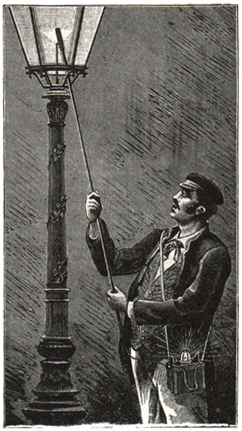 The light they intended to supply was as good if not superior to the electric light. Even the coal gas did not come up to it. Of course there was a big initial outlay, and they would ask the council to deal liberally with them at the commencement on this account. If they get a guarantee from the council to take the light it would not be long before the outside public would see the benefit to be derived from it. They only asked the usual terms given in such instances, which was to give a guarantee for 21 years that it would not take any other light, but the agreement was to be only for 7 years at the first, and a fresh one entered into at its termination. This would allow, in the event of the public patronising the light, of a reduction in the price being made to the council. If the council during the 7 years found the light equal to what they claimed it was asked that they do the best for the company, as the greater the consumption the cheaper the light could be supplied. A clause could also be inserted giving the council the option of purchase at the end of the 21 years. Cr Winters said he would like to see the light burning. Cr Kennedy suggested that that be done before they went any further in the matter. Cr Hardy enquired what price per lamp would be required. Mr. Parkes said that if incandescent burners were put in the cost would be £5, as the burners were very costly, but if not it would be much cheaper. One consideration was that there was much less gas used with the incandescent burners. Cr Watts enquired whether there was not a fear of the gum leaf running short. Mr. Parkes thought not, but whether or no the retorts could be used for coal. The company would be under a penalty to light the streets so they would have to do it. The question was then discussed in a conversational manner, after which it was agreed that as many members as could make it convenient should go to Longwarry, on Tuesday 16th inst, by the 8 o’clock train, and see the light burning. In answer to Cr Watts it was elicited that 5ft of gas was got from 1lb. weight of leaf, and with coal it was about the same.